Equipoise (boldenone undecylenate) is a derivative of testosterone, which is characterized as an anabolic powerful and with androgenic effect. Equipoise is the testosterone molecule chemically having one double bond between Atom 1 and 2 carbon. This modification is done in the same powerful boldenone to testosterone for anabolic properties, while the androgenic properties of the drug expressed in two times weaker. However, practice shows that Equipoise allows you to achieve results lower than an equivalent quantity of testosterone. Boldenone undecylenate is often compared to nandrolone, apparently, is associated with the book of Dan Duchaine, which the author draws parallels between the two drugs, taking into account, however, that an anabolic boldenone is stronger. In fact, boldenone and nandrolone are different. Nandrolone is a progestin and a ni-19, while the steroids boldenone is closer to testosterone. Dan Duchaine later changed his mind regarding the similarity of the drugs, but in the forums, you can still find messages that are not recommended to combine boldenone, nandrolone because of the similarities. Dan Duchaine also writes that Equipoise is more suitable for producing relief and venous prorisovannosti for a set of muscle mass. New forms of preparation: boldenone and boldenone propionate acetate have similar effects, the difference is only in length. Equipoise is well combined with other steroids: Winstrol and Anavar - drying rate; testosterone and trenbolone - weight set direction (in this case, the duration of the course is reduced to 6 weeks as a combination of large extent suppresses the production of testosterone and anti-estrogen should be taken during the course. Consult an expert before starting the course of Equipoise. 2 weeks after the end of the course a course after the course of therapy and taking testosterone boosters for a month to restore natural testosterone. For maximum efficiency, make a package of materials for a set of muscle mass and keep a diet for a set of muscle mass. There are also courses combined for a set of lean muscle mass and standard rates on the set of masses. Specialized pharmaceutical company specialists have developed standardized doses of the drug. Based by many factors, the most important are the physiological characteristics of the organism, the experience of training and so on. The average dose is 400-600 per week for men and 50-150 per week for women. Reception of the minimum dose recommended young athletes steroids and athletes who are in the stage of recovery. 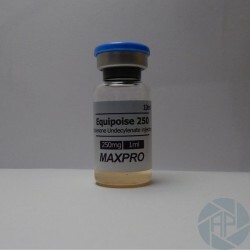 In general, the drug received a lot of positive feedback from athletes, so it is today in day rightly gained a reputation as an excellent preparation for a set of muscle mass. The result of taking the drug, although slow, but nevertheless, it has a stable and gradual. The drug increases power rates and significantly increases the appetite. Equipoise has significantly stimulated the formation of blood. The content of erythrocytes increase improves the oxygen supply to the muscles. This makes this an attractive steroid for athletes. How and when you receive many other anabolic steroids, there are some side effects, which may occur in the case of non-compliance with the dose of the drug.? A good point is the low percentage of flavoring and conversion into estrogen drugs. Also, a low androgenic activity allows you to take the drug to women. Phenomena of virilization are rare compared to other medicines. Boldenone - this is one of the few injectable medications that can be used in bodybuilding for women with less risk of side effects. Also, unlike many other similar medicines, to suppress the production of testosterone, the medication is in the last place, so it is recognized rightly as one of the world's safest anabolic steroids.